On November 10th 2018, Dr Bernhard Seliger and Felix Glenk, accompanying a larger group from the Hanns Seidel Foundation went to Wonsan Bay, DPRK, for a non-birding visit. There they observed a group of 150+ Brant Geese, comprised of two flocks of 50+ both of which flew off, and an additional 50 others which were feeding in and around an extensive area of mariculture, apparently little-disturbed by fisherfolk rowing close-by. This is the highest count of this species in the DPRK known to Birds Korea, and likely the highest count of this fast-declining species in more than a decade anywhere on the Korean Peninsula. The date of observation falls within both the over-wintering and migration period, both of birds moving out from Japan and potentially of birds arriving in the region for the winter from Yakutia (see the comments below Moores 2012 and this article by Sawa Yusuke on the EAAFP website). More research into the origins and final wintering area of this flock is needed. 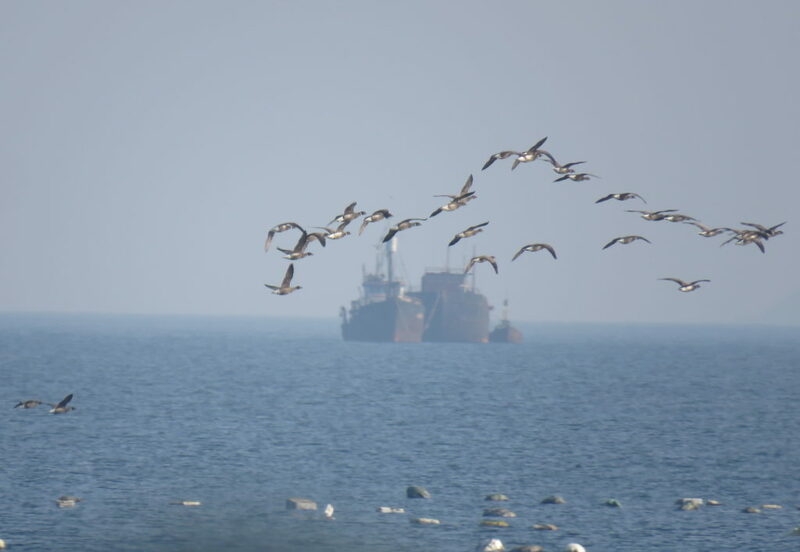 After all, Wonsan Bay is an internationally important wetland for waterbirds in its own right and has supported overwintering Brant Geese at least once before (see below). 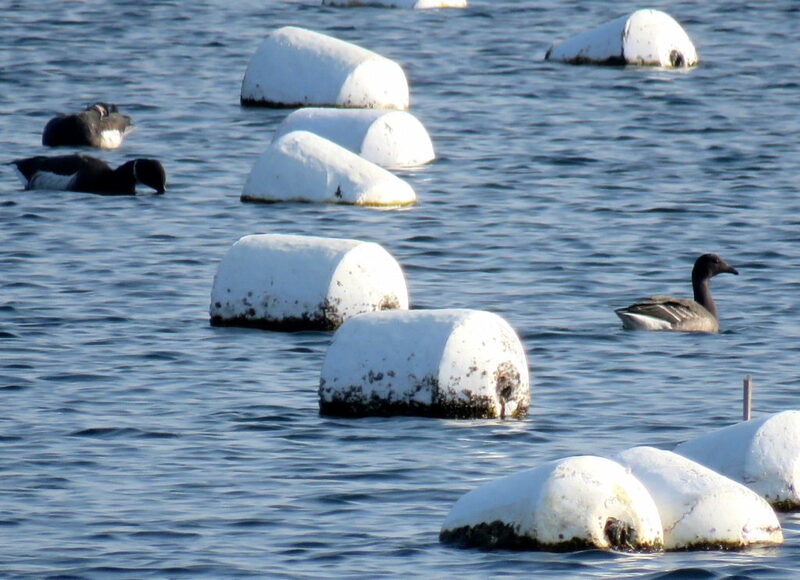 In addition, the bay is very likely used for staging both by birds that are moving along the east coast, and also for birds that intend to cross the narrowest waist of the Korean Peninsula from the East Sea to the Yellow Sea. 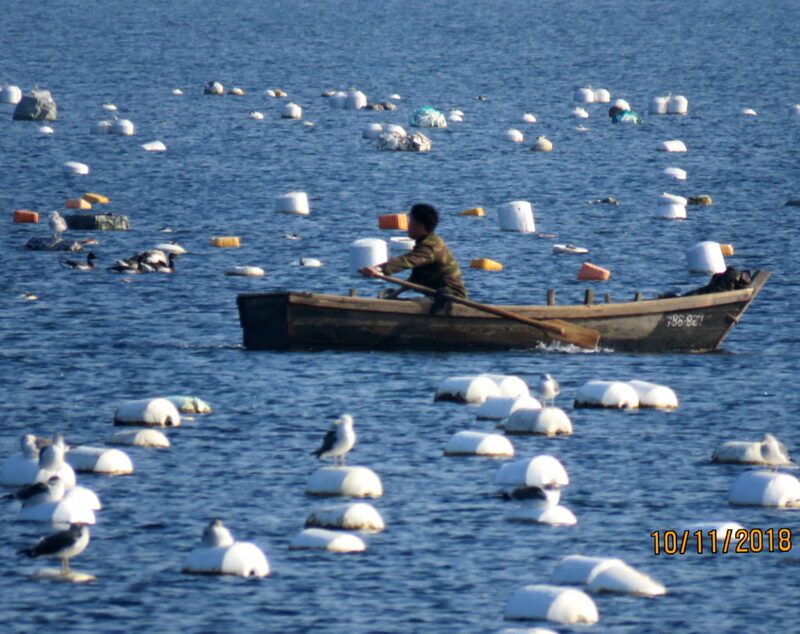 Even the past and current status of the Brant Goose in the DPRK as a whole remains somewhat enigmatic. 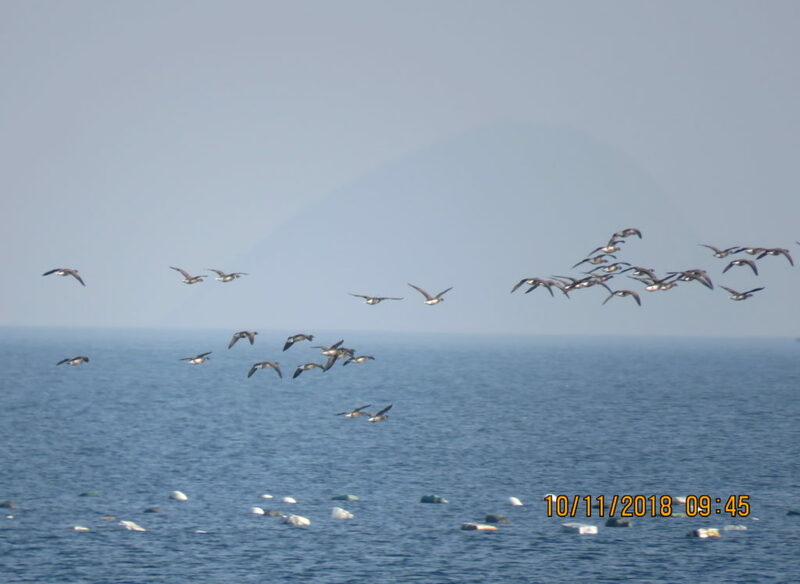 We saw and photographed a flock of 21 at Rason in early April 2017 (Moores 2017) and one was seen in late April 2017 on the Yellow Sea coast of Pyongan Province (Riegen in lit. 2017). Almost twenty years ago, however, only two DPRK records were traced by Tomek (1999): one collected in 1910; and one flock of 16 seen by Fiebig in Wonsan Bay, north of the city, on December 16th 1988 (Fiebig 1993, Tomek 1999). The Red Data Book of Animals (2002) improved greatly on her assessment, and provided three additional more-recent records, including a flock of 40 on April 1st 1991. 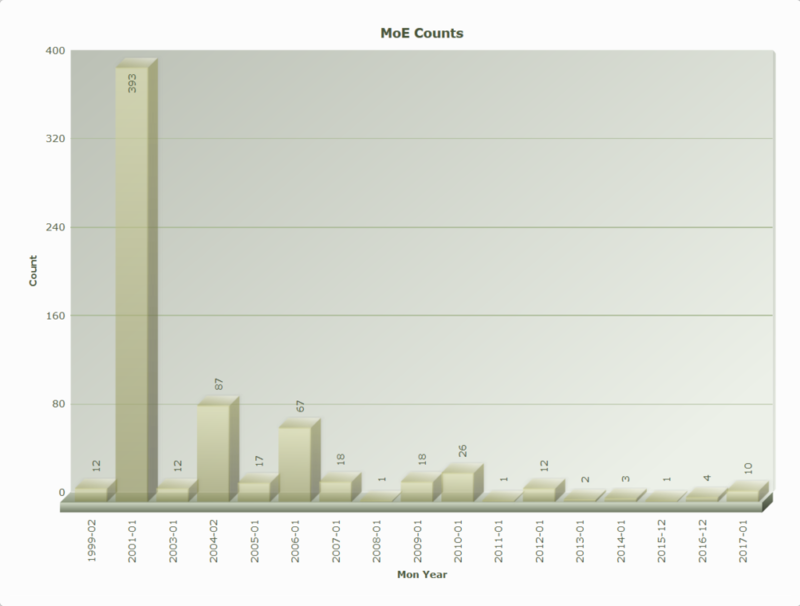 In the Republic of Korea, the decrease in the species noted by Moores (2012) continues, with only ten recorded nationwide by the MOE Census in January 2017. Fiebig, J. 1993. Three Years of Ornithological Studies in North Korea. Mitt. Zool. Mus. Berl. 69 (1993). Suppl. : Ann. Orn. 19, 73-146. Moores, N. 2017. Birds and their conservation in Rason Special Economic Zone, Democratic People’s Republic of Korea. Forktail 33: 124-133. Tomek, T. (1999) The birds of North Korea. Non-Passeriformes. Acta Zool. Cracoviensia 42: 1–21.